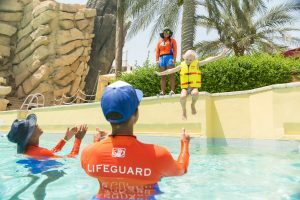 Yas Waterworld’s Annual Pass membership for all water enthusiasts and adventure seekers just got more exciting with the addition of remarkable benefits. Besides experiencing a fun-filled year at the one and only Emirati-inspired waterpark, new Annual Pass members at Yas Waterworld will enjoy a wide selection of benefits including special birthday tickets, a 25% discount on all food and beverage at the park, a 25% discount at the waterpark’s retail shops, and a 25% discount, which can be offered to their friends. If that wasn’t enough, Yas Waterworld is also introducing the Junior Aquatics Club for its young members aged 6 to 12 years old. On the first Saturday of every month as of the 6th of May, parents can bring their kids to the park to enjoy educational and entertaining activities offered exclusively to annual pass holders. Kids will be able to develop new skills while having fun with activities such as freeze tag, races, tips on sliding, compact jumps, and much more!